The Universal Charging Port (located above the display) is only used to charge another device (e.g., smartphone, battery pack, etc.). 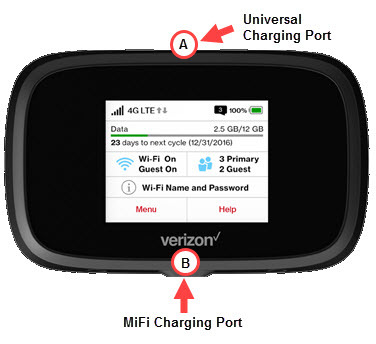 The MiFi charging port (located below the Verizon logo) should be used to tether, charge the Jetpack, and file share. Using the MiFi charging port, connect the Jetpack to the computer using the supplied USB cable. If applicable, allow time for the computer to detect the device and install the necessary software. The device is setup and functions as an ethernet connection (no connection software required). Allows internet access via both Wi-Fi and the tethered USB connection. Allows internet access only via the tethered USB connection. From the connected computer, launch a web browser.